This well-equipped Nissan Titan Crew Cab Pro-4X crosses the checkout counter at $54,290. That sets some high expectations for this full-size 4×4. And for the most part, it impresses. LED headlights and tail lamps, integrated turn signal towing mirrors, proximity entry, a power locking tailgate, and LED cargo bed lights are among its key exterior features. 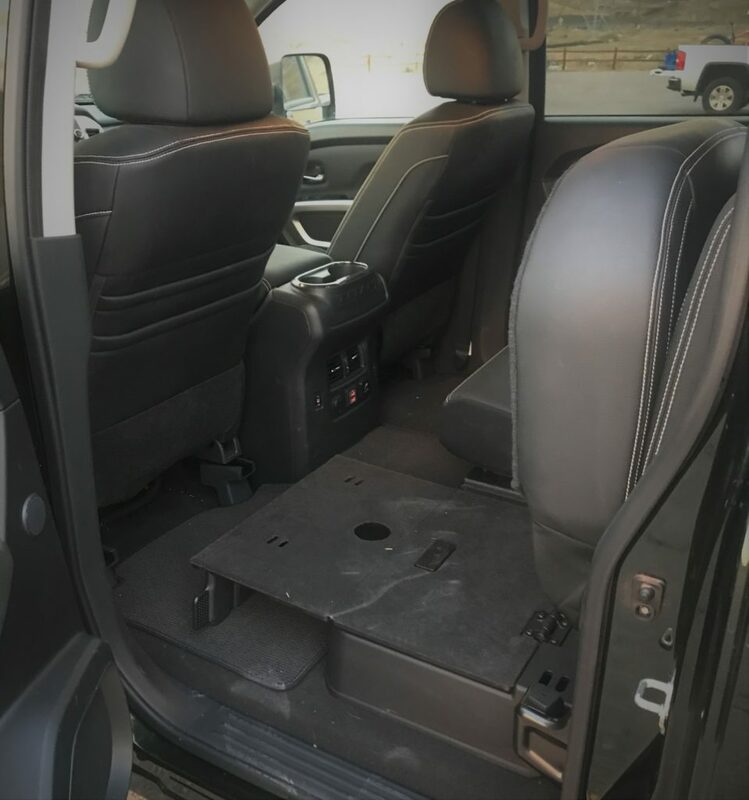 Inside, leather seats are heated and ventilated upfront and heated for the rear passengers who are also treated with HVAC vents and multiple power outlets. When the seat isn’t in use, it can be folded upward to expose a fold out floor. It’s a large useful surface though wider opening doors would further improve the crew cab’s usefulness. The driver is treated with a heated leather steering wheel which features audio and menu controls that seem out of sequence – the menu selection control resides between audio controls. 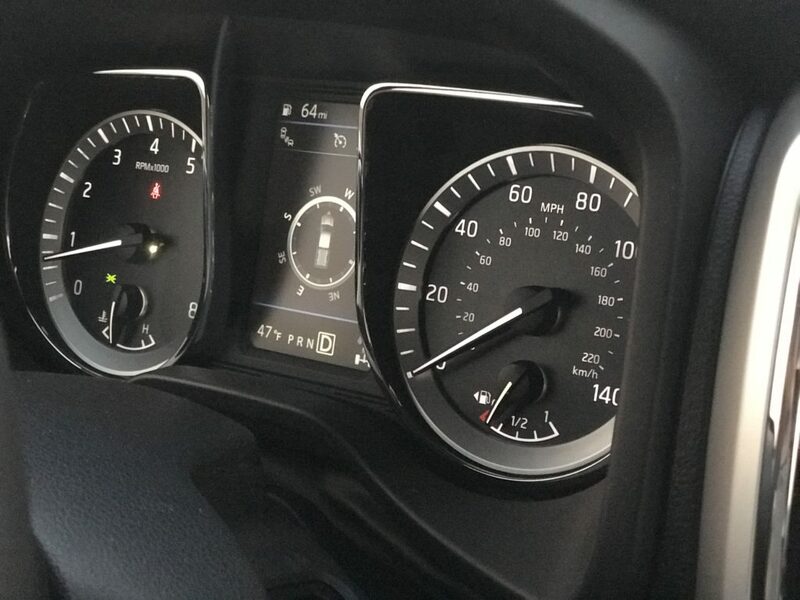 The combimeter includes two impressively detailed analog gauges and a center digital display. 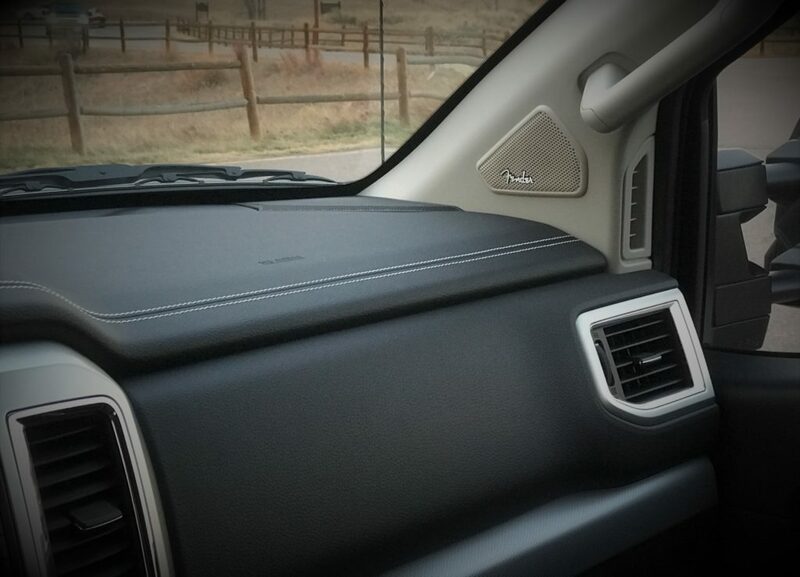 The seven-inch infotainment touchscreen features navigation, the exterior surround view, Apple CarPlay, Android Auto, and SiriusXM while the Fender 12-speaker audio system delivers a very impressive experience. A layout focused on purpose. Soft touch materials and contrast stitching help it feel special. 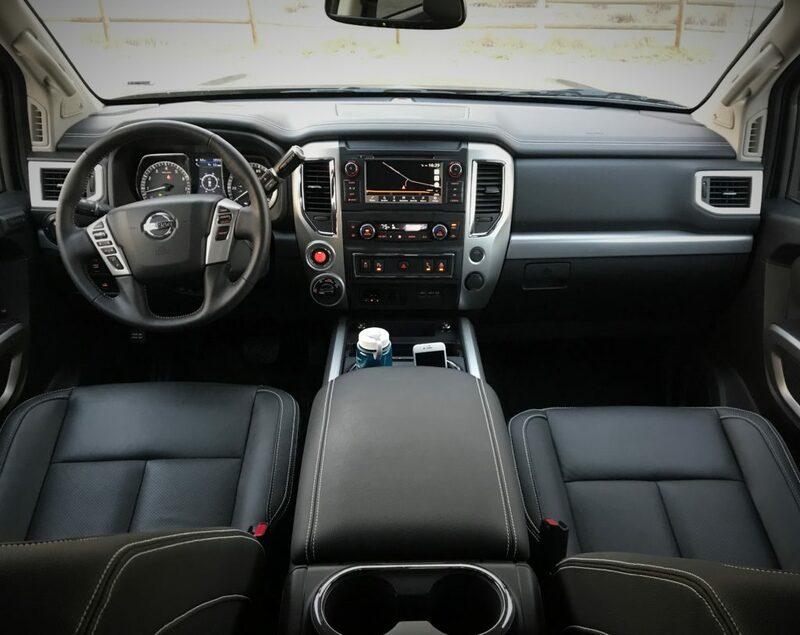 The Nissan Titan is offered in many trims and the middle-of-the-road SV trim can be specified in crew cab form and with four-wheel drive for about $44k albeit without leather and the premium audio system. 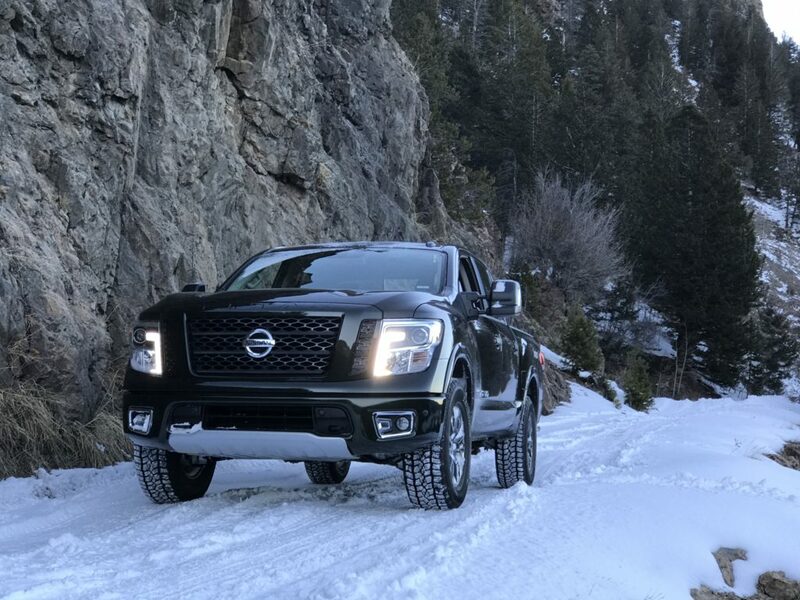 The Nissan Titan does without most active safety tech that has quickly become expected at this price range. A blind-spot warning system with rear cross traffic alert, automatic headlights, and front and rear distance sensors are among the optional assistance systems while active braking is unavailable. The Titan earns “Good” ratings from the IIHS for crash ratings and the pitch-adjustable headlights earn a “Marginal” score. An integrated trailer-brake controller, tow/ haul mode, and trailer sway control add another level of safety and control when maximizing the trucks towing capabilities. 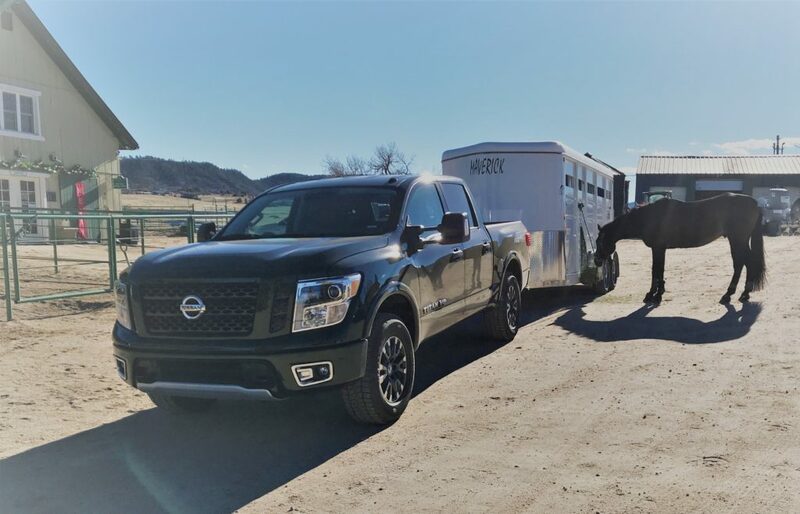 The Nissan Titan Crew Cab is about the same exterior size as the Toyota Tundra crew cab and is large by any normal standards. The roofline slopes smoothly into the large a-pillar area which earns the Titan a distinguished side profile though it limits forward visibility. The Titan Pro-4X is ready for an off-road adventure with an electronic rear locker, Bilstein shocks, and additional underbody protection. During parking situations, the large hood reduces the look down angle, though thankfully, the proximity sensors are there to prevent any bump and grind. The styling theme inside is relatively straightforward and focused on functionality. Soft touch upper dash and interior panels feature contrast stitching and dress up the interior, though, several interior trim pieces were poor fitting. Back seat legroom is about four inches less than in Nissan’s competitor, the Tundra, though the seats’ limited backrest angle will generate the loudest complaints. 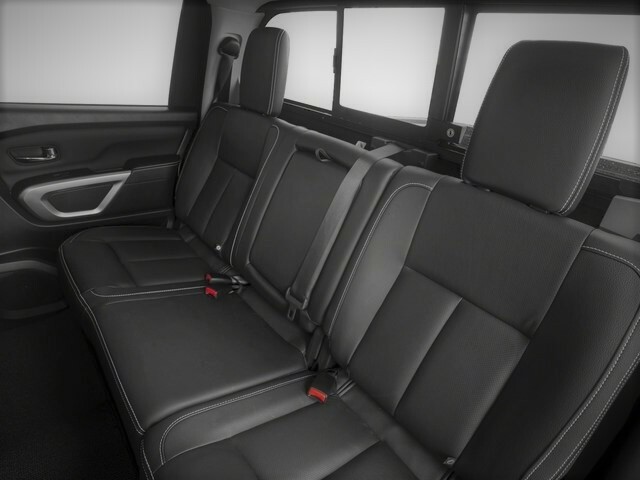 There’s plenty of rear legroom and features for the rear passengers though more recline would further improve overall comfort. 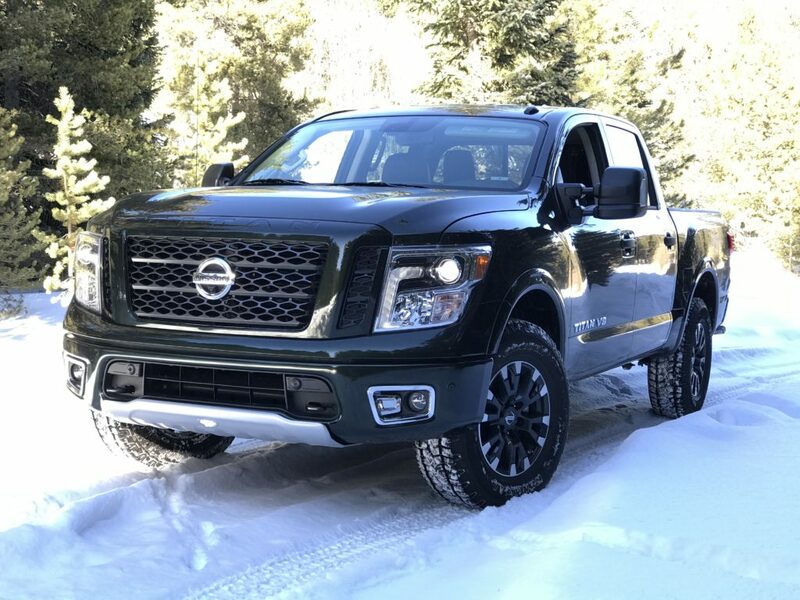 The Nissan Titan is standard with a smooth operating powertrain that consists of a 5.6-liter V8, a seven-speed transmission, and an available part-time four-wheel drive. The engine features advanced control over the combustion process to efficiently deliver peak ratings of 390 horsepower and 394 lb-ft of torque. Compared to its turbocharged competitors, the V8 builds its power higher in the rev range which is more exciting but less capable off the line. 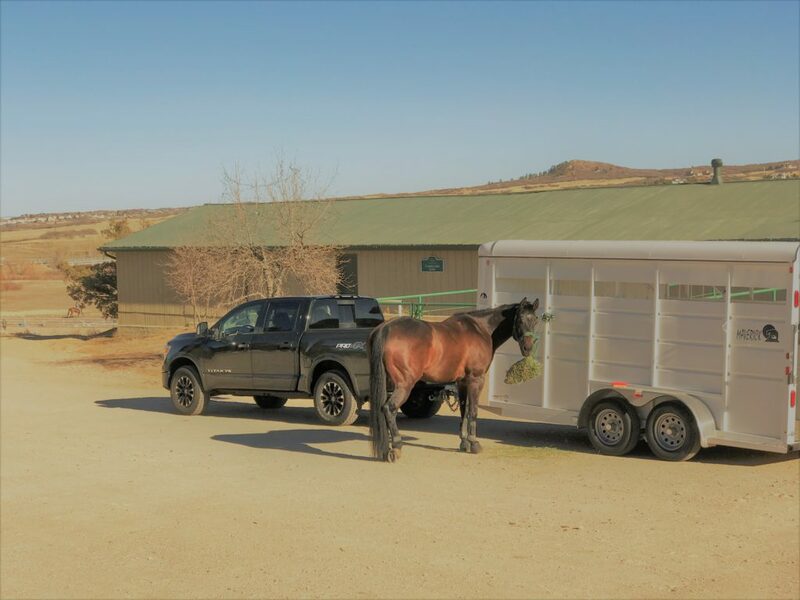 Unladen, the power is more than sufficient and, even when pulling an empty horse trailer, full throttle was only necessary when merging onto the highway. Under less stress, the transmission’s crisp changes are replaced with a slip and slide of shifts until it locks into third gear which often bogs the engine. It feels and sounds odd. To remedy this, apply more pedal, and apply it quickly. A rocker switch on the transmission shift stalk is there to limit the maximum gear and reacts quickly to downshift requests. Heated seats and steering wheel were much appreciated during these evening mountain shots. In this Pro-4X trim, available only with four-wheel drive, off-road goodies are standard such as hill-descent control (particularly advantageous when descending icy slopes) and an electronic locking rear differential which proved to be my lifeline during a deep snow extraction. Letting this V8 sing with a rappp! (open the rear window for maximum effect) is one of the most alluring features of the Titan. Plenty of power at these heights. Low Range was helpful in deep snow to keep the engine revving high for peak power. 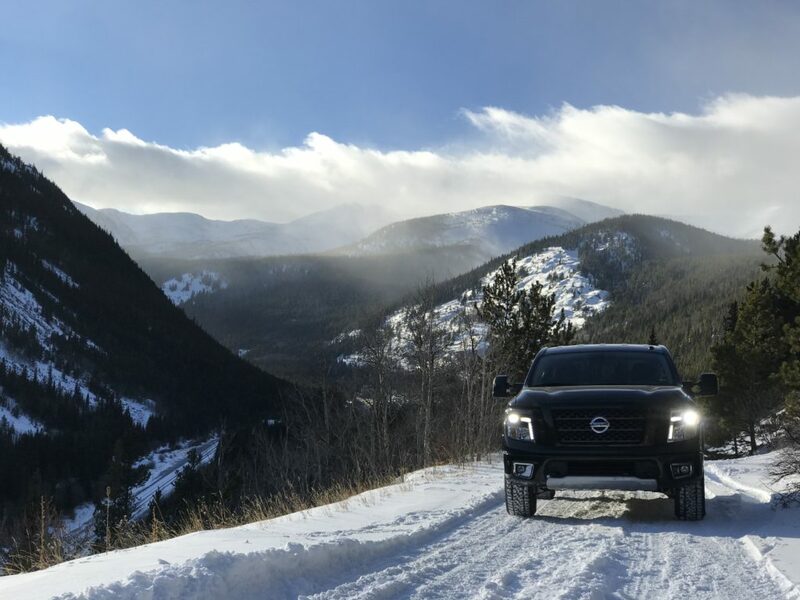 The Titan is more fuel efficient than before and combined with many other efficiency improvements, it earns 15 mpg city, 20 highway, and 17 combined. This falls in line with the V8’s from Ford and Chevy and well ahead of the aged Toyota Tundra. During my week of commuting in heavy traffic and highway jaunts, I achieved closer to 16 mpg. The 20 mpg rating (determined by the government, not Nissan) feels unattainable in the real world. The chassis is tuned for a typical truck ride. A bouncy front suspension and a bit of an after-jiggle body shake keep the chassis busy after bridge seams and mid-turn bumps. The off-road shocks are a part of the Pro-4X trim and are excellent when put in their element. The suspension absorbs big bumps without drama and builds a sense of indestructibility during some time spent in deep snow. Back on the pavement, road noise is kept to a minimum though the large tow mirrors generate notable wind noise that is too much even for the dual-pane door glass. The steering is light enough for an easy touch at high speed however boost isn’t heightened at low speeds and makes for two handed lock-to-lock steering maneuvers. Navigating this truck and its 48-ft turning circle through crowded parking requires a lot of turning that wheel too. 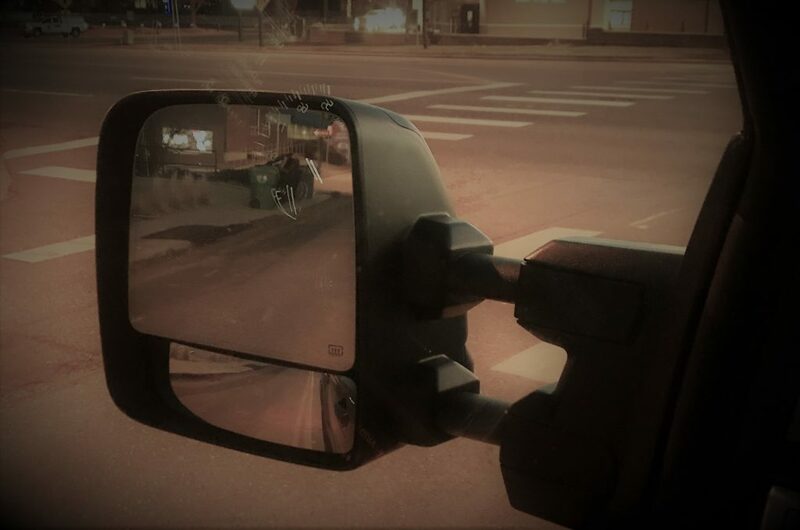 This image is enhanced to try and capture the level of distraction that reflections can cause in the real world. This is Nissan’s second generation of the Titan and debut for the 2017 model year. While bringing notable improvements, today’s pick-up buyers expect an increasing level of capability with fewer compromises than ever. The Titan lives up to many of those expectations and also adds in a banging stereo and a free-revving V8. Where many will argue the best kind of horsepower. The combimeter gauges are nicely detailed and would look at home in an Infinti. 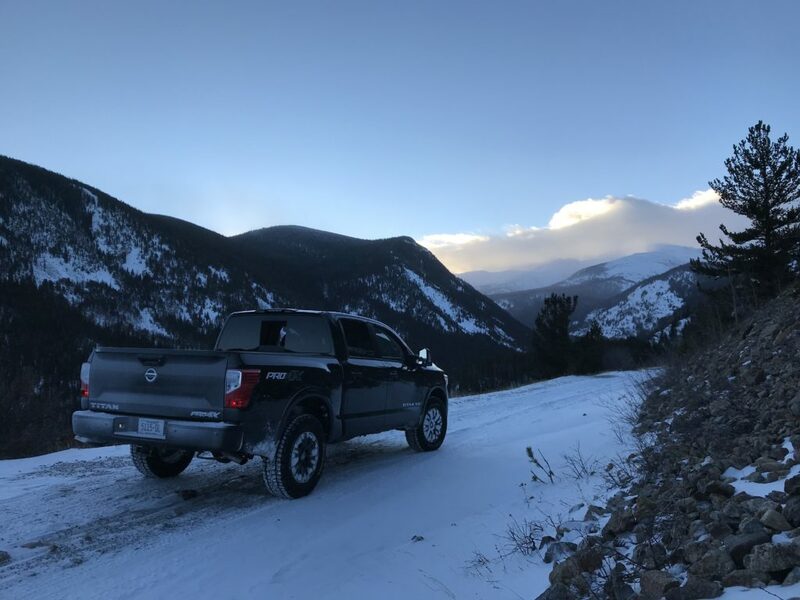 Looking handsome on Colorado’s back roads.